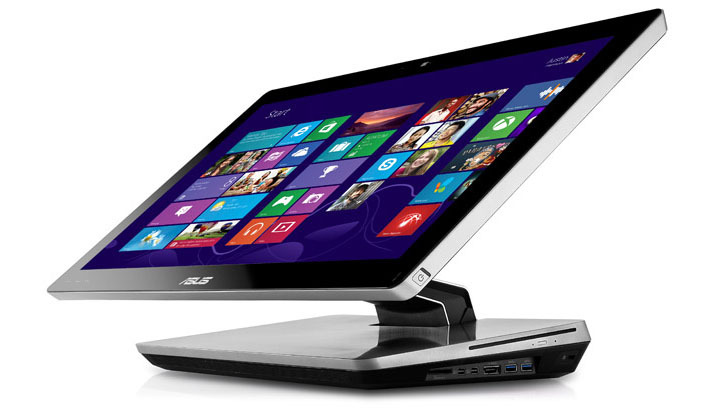 The All-in-One PC Series is another one of ASUS windows 8 line-up, with— a fully-fledged desktop PC with a 23” multi-touch display. With Intel i7 desktop processors, lifelike audio and user ergonomics all incorporated in its sleek and neat design, the ET2300 is perfect for productivity and home entertainment. The ET2300 has a unique double-hinge design that allows it to be used both as a traditional desktop with an upright display and as a digital canvas that folds flat parallel to the table top. It is the first All-in-One PC with a built-in array speaker and subwoofer, an external subwoofer, and ASUS SonicMaster technology — these enable the ET2300 to deliver incredible acoustic fidelity unheard from other PCs. In addition, Intel Thunderbolt, Intel Wireless Display (WiDi), and USB 3.0 provide flexible and future-proof connectivity. The ASUS ET2300 is powered by the 3rd generation Intel Core i7 desktop processor with discrete NVIDIA GT630M (1GB/2GB) or Intel HD 2500/4000 graphics for impressive performance. WiDi makes it easy to enjoy audio, video and photos with family and friends through seamless wireless streaming to WiDi-enabled HDTVs. Two Intel Thunderbolt and four USB 3.0 ports provide ultra-fast data transfer speeds and flexible expansion options, while HDMI input turns the ET2300 into an HD display for game consoles and Blu-ray players. I don’t know anyone who still owns a PC, but if you are looking for one this one is your best bet.